We launched the Ewafe project in June 2013, to address the problem of the increasing numbers of children being abandoned in Kampala’s slums. ‘Ewafe’ means ‘where we belong’ in Luganda, and this is what this project aims to do – to bring hope and love to vulnerable children, to rescue children who have been abandoned and to give them a home, a family and a place where they feel they belong. Since launching this project in June 2013, we have achieved so much! In August, we bought 2 acres of land to build our emergency care centre for abandoned children. This will mean that children will have a safe place to stay and be cared for once they become abandoned and are referred to KCK’s care. The long term aim is to reintegrate these children with family members where appropriate or find loving families to adopt them into their homes. In October, we received a generous donation towards the first phase of the building and we are very pleased to announce that the digging of the foundations and laying of the concrete slab is almost complete! First we cleared the land of bushes and scrub, and then built in an access road and driveway for construction vehicles to enter the land easily. After that we built a small guard hut to keep the tools in and started marking out the ground. 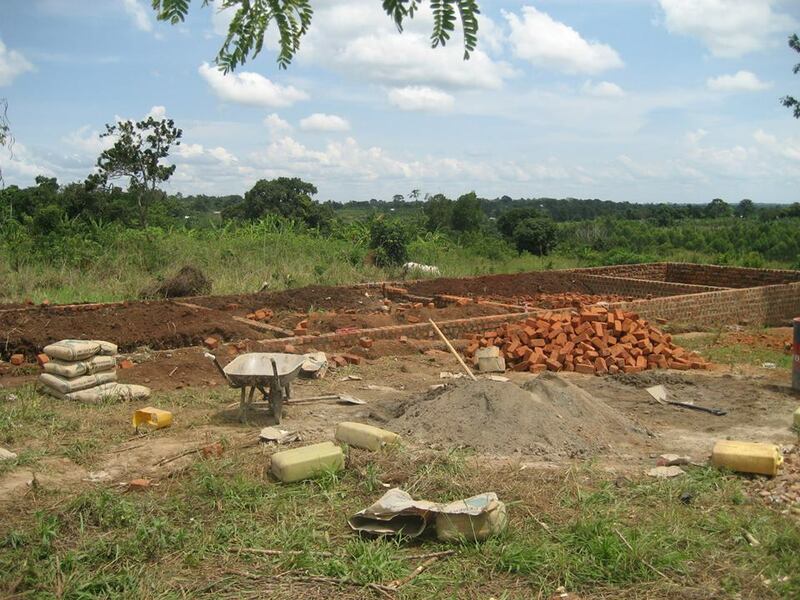 We then started to dig the foundations and laid bricks to begin the construction of the walls of the Ewafe home. This home will house children who have been abandoned and need an urgent emergency place to stay while we either trace their families or look for suitable foster families to place them in. This shelter will also house the abandoned and orphaned children who are currently being sponsored to go to boarding school but have no where to stay during the holidays so have to stay at school. We are so excited about the progress of this project and would like to say a huge thank you to everyone who has worked so hard to bring us this far. We now have 5 children being fostered, 10 abandoned children being sponsored to go to school and the first phase of building the Ewafe home is complete! Thank you so much to all who have donated, fundraised and spread the word about this project, we really appreciate your support! However, we still have a long way to go until this building will be complete – it still needs walls, doors and windows, a roof and furnishings inside. Even a small amount goes a really long way and we would love your help. If you could donate please do so here https://my.give.net/ewafeproject. Also, if you would like to support The Ewafe Project through fundraising, through prayer or through providing other resources that may help, please do let us know. Newer PostThe Strength of a Ugandan Woman! Older Post"Poverty is not natural"...but generosity is!